Dalguise (Scottish Gaelic Dàil Ghiuthais) is a settlement in Perth and Kinross, Scotland. It is situated on the western side of the River Tay on the B898 road, 8 km north of Dunkeld. Located there is Dalguise House, a place where from the age of four Beatrix Potter stayed annually with her family throughout the summer, from May till the end of the salmon season. Whilst staying at Dalguise, Beatrix wrote a 'picture letter' which provided the basis for her first book 'The Tale of Peter Rabbit'. Similarly, a later book 'The Tale of Jeremy Fisher' also started life as a picture letter with characters clearly based on her study and exploration on the Dalguise beat of the River Tay. 'The Tale of Mrs Tiggy Winkle' was published in 1905 and is almost certainly based on the Potters' old washer woman at Dalguise, Kitty MacDonald. Dalguise House itself is now the location of an outdoor education centre, Dalguise PGL. 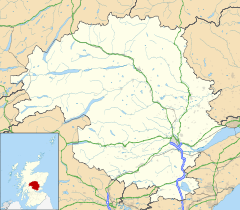 This Perth and Kinross location article is a stub. You can help Wikipedia by expanding it.